Photo: Erika Carlos About a hundred community members gathered at De La Guerra Plaza on Thursday to demand the release of special counsel Robert Muellerâ€™s full report on his investigation of President Trump and Russian interference in the 2016 elections. 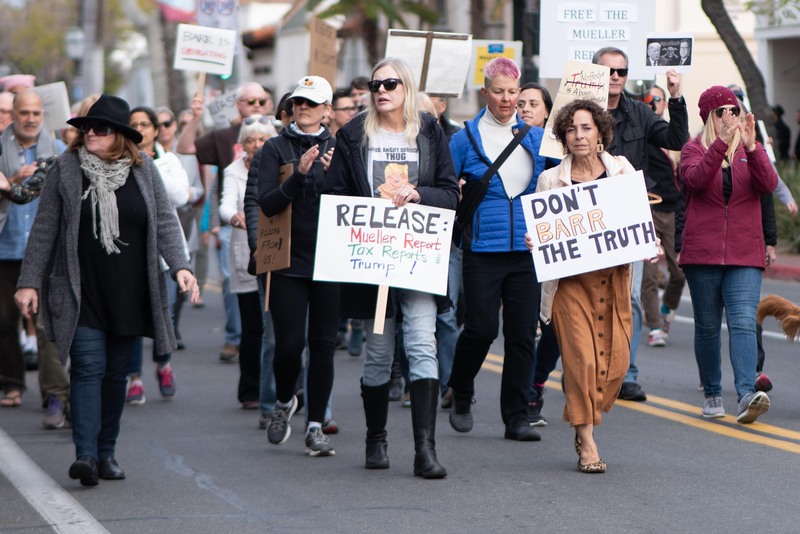 On Thursday, April 4th, dozens of Santa Barbara locals marched in protest for the full release of the Mueller report. It has now been two weeks since Robert Mueller submitted his full report on his investigation into President Trump and his alleged collusion with Russia during the 2016 election. Attorney General William Barr received the report and has since provided a summary of the findings but has not released the report in its entirety. Across the country, Americans have protested for the full report to be made public.